I understand the need for a top-of-the-line chainsaw, regardless of cost. But if you’re like me (and most homeowners are), you are looking for something that performs well without breaking the bank. 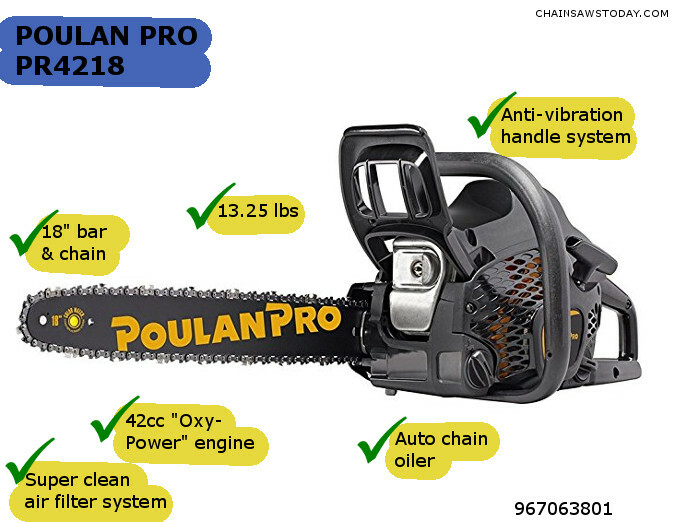 A Poulan Pro chainsaw may be just what you need. I consider Poulan Pro to be the “no-nonsense”, working-man’s brand. A no-frills, heavy-duty saw at an affordable price. And don’t forget, Husqvarna owns Poulan Pro and makes all their saws. That means many of the same design targets are used, as are many common parts. I think Husqvarna uses the Poulan Pro brand as a “price-fighter”, allowing them to play in a less-premium brand space without sullying their premium brand name. In some ways, this is like Lexus and Toyota, or Ford and Lincoln. There’s nothing wrong with a Toyota, but not many people who are shopping for Toyotas will cross-shop up in the Lexus brand space. What I want to do here is introduce you to the Poulan Pro brand, and review a number of their affordable saws to see if any of them are right for you. You have probably heard of the Poulan brand. Most folks recognize their tools as being durable, priced right, and comfortable to use. That type of reputation has been cultivated by Poulan for decades. They seem to be dedicated to bringing products to market that are well-liked by the average consumer. You may remember that Poulan Pro is the 2nd most popular chainsaw brand in 2018, behind only Stihl. It all started with a guy named Claude Poulan. Claude was a lumberjack, and spent many years of his humble, hard-working life cutting down trees. I think it’s important to understand the distinction between someone who cuts down a nuisance tree every now and then, or perhaps cleans up a big plot of land after a storm, versus someone who spends years earning their living doing it. If you don’t do it well, you either get hurt or your get fired. You don’t pay your rent, and you don’t eat! It’s in that context that we see the significance of Claude Poulan starting the Poulan Saw Company in 1946. A former lumberjack brings certain qualifications to the table when he starts a saw company! 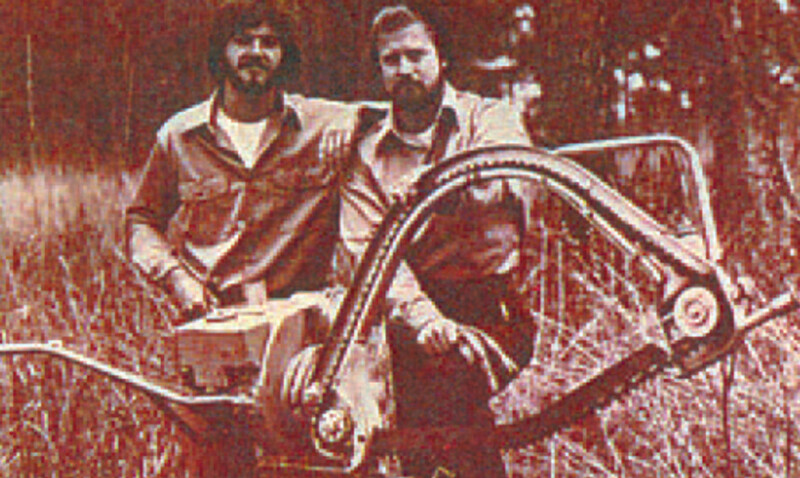 Poulan began manufacturing robustly designed, affordable chainsaws for professional lumberjacks in Claude’s hometown of Shreveport, Louisiana. You may have already read that the first chainsaw models were two-man machines. These things weren’t for the faint of heart, but did help increase throughput of the lumberjack crews. Poulan’s designs and manufacturing capabilities continue to grow – along with their reputation – throughout the 1950’s. 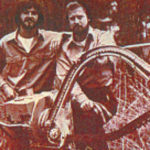 By the 1970’s, Poulan had created a market for lightweight, consumer-duty saws. 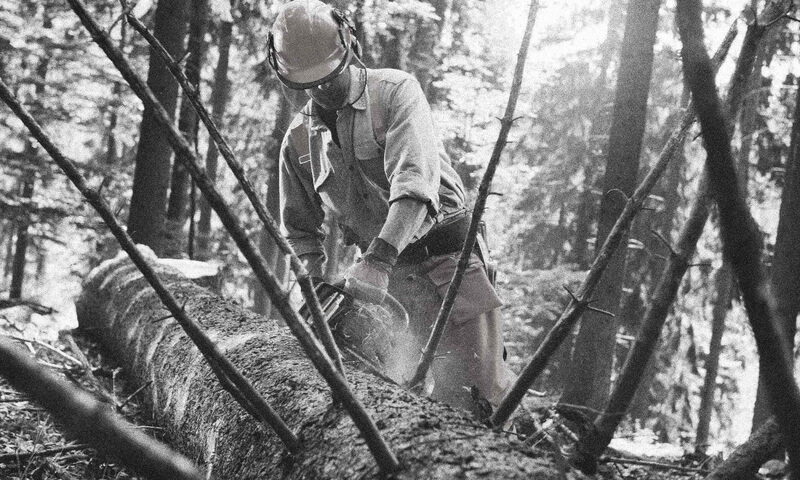 The same quality and durability went into these saws as what was marketed to professional lumberjacks, but they had been downsized and redesigned for mainstream consumers. Poulan created this niche where saws built for non-professional users were appropriately sized, and didn’t require someone to take out a 10 year mortgage in order to afford them. At the time, that novel idea was considered a “light-duty” saw. But these days, we’ve come to recognize them as more medium-duty for the average consumer. 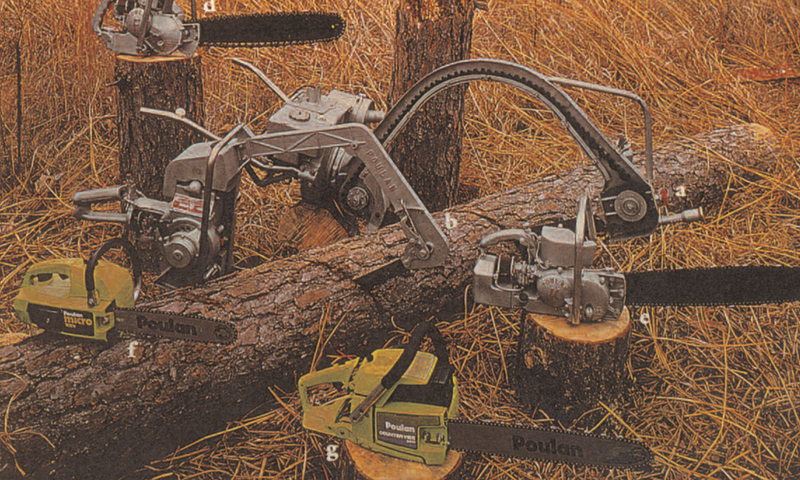 In some cases, Poulan has kept up with the market by adding features to its saws. But they aren’t known for being obnoxious about it. If a feature makes sense for the sake of safety, or improved productivity, they tend to gravitate towards it. 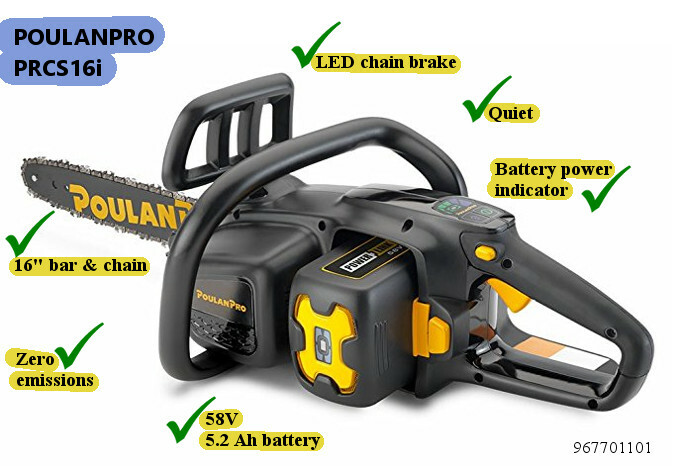 Recognizing some of the benefits of battery-powered chainsaws (like ease of starting, less maintenance, reduced noise and vibration), Poulan has been fairly active in the last decade or so in this segment of the market. 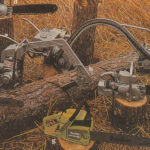 In the rest of my article, I’ll try to touch on some of the best, most popular Poulan chainsaws – both gasoline and battery. If you are looking for easy to handle, durable, affordable machines, I think you’ll find Poulan is one of your best bets. And based on their overwhelming popularity, it’s clear these guys know how to make a chainsaw! Many of you might not realize this, but Poulan Pro and Husqvarna are the same company. Although that may come as a shock, it can actually be construed as good news. These two brands are recognized as being industry leaders in the chainsaw market. The fact that they are one in the same is a benefit to consumers like us. In many cases, critical components are actually shared between Husqvarna and Poulan Pro saws. This is particularly true for engine components. The exterior package, as well as many of the “add-on” features may differ, but the stuff that really matters is quite frequently shared. That’s great news when it comes to their incredibly durable 51cc 2-stroke engines. In developing the new PP PR5020, Husqvarna spent considerable effort to address several complaints about the previous model. One example – they changed back to a manual adjustment for tensioning the chain. Although tool-less adjustments are all the rage, in some cases they can be less durable. This new manual adjustment is very beefy, but slightly less convenient since it requires a wrench. The address that, the Poulan Pro has a handy storage spot for the wrench. It simply clips into the back of the machine. It’s not advisable to try and adjust chain tension on any saw while it’s running. Since you’re likely to have to pause you work in order to make an adjustment, whether with a tool or tool-less, this isn’t really a deal-killer. As I mentioned before, the 51cc engine has many shared components with the Husqvarna saw. It is extremely well-reviewed, and is considered a durable workhorse in the industry. They worked some magic with the intake design, and are able to remove much of the debris before it gets to the air filter. That significantly reduces the frequency with which you must stop and clean the air filter. The engine uses a primer bulb that is manually actuated. That means the operator primes the carb with fuel by pressing the bulb several times. The advantage to this is it’s much easier to purge the system of air and get fuel into the carb with the primer bulb than it is to yank on the recoil several times. I think this is a very thoughtful feature. The saw also has an integrated choke/stop control lever, which is easy and intuitive to use. The OxyPower engine is rated to be quite fuel efficient. It’s lightweight, and performs well with plenty of power despite meeting the tightest emissions standards for chainsaws. Most customers have raved about the engine. The few complaints that I’m aware of are related to hot restart. I tried this out, and understand where some of the complaints are coming from. Especially on a warm day, hot restart is more difficult than on other saws. This is purportedly because this particular 51cc is designed with tight clearances between the rings and cylinders. That can mean more friction, especially when new, which means more heat. Shutting it off after running it very hard on a warm day means more fuel in the carb has vaporized, and requires some priming before re-start. I suspect this condition would improve quite a bit after a few hours are put on it, and the rings wear in. A few folks in the internet have made comments about the PR5020 coming with a “light-duty” chain. This is a pretty silly thing to complain about. First of all, the chain that comes on it is an Oregon Vanguard 70-link chain. We aren’t talking about no-name junk here! And second of all, raise your hand if you are going to repeatedly use this thing for severe duty? I understand that we all want to be able to get the job done, regardless of how difficult/big. But this chain will be good enough for 98% of us. One option is to put an Oregon 72LGX070G chain on the bar. Many folks would consider this a professional-grade alternative. In my personal opinion, that extra expense is unnecessary. Upgrade if you want. The engine itself runs quite smoothly. It has good reaction speed to throttle inputs, and feels powerful and torquey. It runs to 9,000 rpm, so when you crank open the throttle it responds eagerly. If you want a quiet saw, you’ll have to buy a battery one as opposed to a gas-engine one (as previously detailed here on ChainsawsToday). This one isn’t really any worse, and may even be slightly better than, some of the competition. Regardless, you’ll want to wear hearing protection at 9k rpm! It is a light, well-balanced saw. The handles are positioned well, and seem to be padded with some extra-thick stuff. The anti-vibration attention to detail here pays dividends, as the saw is comfortable and ergonomic to use. I’m not sure if I would call this an “all-day” saw, as it isn’t really designed to be a commercial-grade, pro saw. For that matter, no matter the design, I’m not sure I could use anything all day long without collapsing in exhaustion. But it really is low-vibe and comfortable. The chain brake works well, and the hand guard is well-positioned. All of the controls, knobs, levers feel sturdy. It’s almost like Poulan wanted to strip off the unnecessary stuff, and beef up the stuff that was left. The automatic chain oiler on the PR5020 is manually adjustable. You can adjust the amount of lube depending on the working environment. I find this further evidence that Poulan wanted to focus on the important stuff, and leave off features that were discretionary. I’m sure if you’ve spent any time shopping around for a solid 20″ gas saw, you will already recognize the value the Poulan Pro PR5020AV brings to the table. With the same engine as the Husqvarna equivalent, this is like buying a premium saw at a bargain price. Poulan doesn’t shirk responsibility with the warranty – offering a standard 2-year warranty. Yes, you can buy cheaper saws. But at this size and with this power level, it’s a pleasant surprise to have the reputation and durability this saw offers. Affordable quality and performance are really the key benefits here. Pro Tip : What’s the difference between the Poulan Pro PP5020AV and the new PR5020 model ? Answer : The only difference between the older Poulan Pro PP5020AV and the new PR5020 model (967061501) is the engine. These are both 50cc two stroke-engines with some minor differences. The PP5020AV uses the DuraLife engine which is renowned to be a tough, almost indestructible engine. The new PR5020 uses the OxyPower engine which is more fuel efficient and has lower emission levels. Though both engines are CARB certified – so they both meet very strict emission control requirements. You can ask a lot of people about the pros and cons of these engines and you’ll get a different answer every time. In my opinion, the DuraLife engine is preferable. I’m only saying this because it’s proven itself time and again. Newer low emission engines aren’t usually as tough as older less refined versions – again this an opinion and not fact. The OxyPower engine may prove itself in time. We already know that the DuraLife engine doesn’t quit on you – it’s been around long enough for people to confirm this. The way I see it, if you’re an old-school Ford F250 kind of guy, the PP5020AV with its rough and ready engine is the one to go for. If you’re more of a Toyota Prius kind of guy, the newer model with its cleaner burning, low fuel consumption engine will be more your kind of chainsaw. In the end, they’re both going to be the same from a user point of view. I can’t say for sure, but I would think that the new OxyPower engine is going to cost a little more to service. The newer and more advanced engines always are. Many homeowners do not like the hassle of traditional gas chainsaws. Although quite powerful, the gas and oil element strikes a nerve. Maintaining a special mixture ratio, running out to the gas station to refuel, even pouring the fuel in there, is a pain. No doubt about it, battery products offer the ultimate in convenience. They are easy to start – just push a button! They are easy to refuel – just clip in a new battery! There are no emissions. They are much quieter. They require less maintenance, with no need for air filters, fuel filters, or spark plugs. 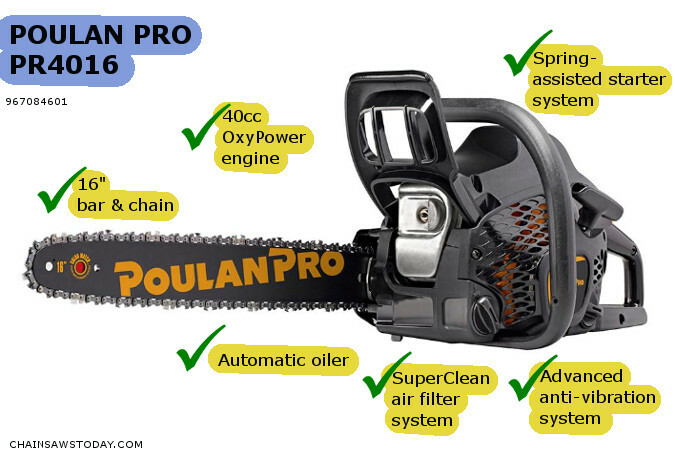 The Poulan Pro PRCS16i is a battery-powered chainsaw that matches up well to smaller gas saws. It has a 16” bar and chain and uses a powerful 58V lithium-ion battery. With a 5.2 Ah battery, you have the runtime and the power you need to get the job done. Because the saw uses a very efficient, zero-maintenance brushless motor, you will get the extended working time and hassle-free experience you want with a battery saw. This same battery is now being used in quite a few other Poulan and Husqvarna battery-powered garden tools. That means you can use the same battery for all of them. The battery also has bright LED charge indicators to help you keep an eye on the battery level. Like many chainsaws, it has an automatic chain lubrication system. The oil reservoir for this system has an easy-view window, making it easier to keep an eye on your lube level. With all these safety and convenience features, the PRCS16i is very comfortable and easy to use. The 16” bar means that you have enough size to get through most medium to large jobs. The typical homeowner job of sawing through 6-8″ diameter limbs is no sweat. Felling actual trees is certainly doable, but just keep in mind this isn’t a 20″ saw. Power is of course a concern with any battery device, usually more so than with a gas saw. Runtime is one thing, and you can always buy more runtime with a spare battery. If you’d like to purchase a spare, they are commercially available. But max electric motor power is another topic. Bearing down hard on the saw to cut faster and power through a log or tree is not advisable. The motor and battery have a control system which will shut them off if you put too much pressure on them and try to cut too fast. You are better off being patient and letting the saw cut at a reasonable rate. And of course keeping the chain sharp and well lubed. The PRCS16i is a good value, and makes for a very affordable battery chainsaw. It has the features and performance you want when converting from gas to battery, and it’s a great option for a mid-sized saw. A step up from their 16″ saw, but seated just below the 20″, the Poulan Pro PR4218 is a solid intermediate chainsaw. Poulan rates it as medium duty. It is a great tool for those homeowners who tend to do work on medium sized trees, remove branches, and cut firewood. 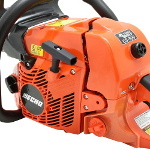 The 42cc 2-stroke engine in this saw uses the same OxyPower technology as other Poulan Pro saws. This means a strong focus on power, but with reduced emissions levels and improved fuel consumption. Even if gas prices are high, you probably won’t go broke keeping fuel in your chainsaw. But nobody enjoys stopping what they are doing to gas up. The Super Clean air filter system helps keep debris out of the carb, which means less hassle for you in the long run. Maintenance is usually no fun, and it’s awesome that the guys at Poulan recognize this and bake in little features that save you time and effort. The low-vibration handles they advertise consist of soft grips and what looks like isolation bushings placed in key locations. These are really great, and fit my hand well. Less vibration means less fatigue and fewer blisters, something we can all appreciate. This saw weighs 13.25 lbs. It’s not the lightest saw on the market, but it has a good power to weight ratio, and feels well balanced. I found it easy to start, whether hot or cold. Don’t forget the saw has the automatic chain lubrication system, as well as the nifty wrench storage solution. A well-thought out design from Poulan Pro! If you are looking for something in the 18″ range, you may be hard pressed to find something that offers more bang for the buck than the PR4218. ✓ View or download the PR4016 owner’s manual. As the model number implies, the Poulan Pro PR4016 is the little brother to the excellent PR4218. The 16″ bar and smaller engine make this saw lighter, but in weight and in duty. Like its bigger 50cc brother, its 40cc engine is a 2-stroke using OxyPower technology to deliver good power and fuel efficiency with less emissions. And yes, even though it’s the smaller, less expensive engine, it still has the SuperClean air filtration system. The spring assisted recoil starter is similar to the other Poulan saws, making starting much easier. That’s also improved by the primer bulb, which helps get fuel flowing for that first-pull start. I’ll admit that when I tried out the PR4016, I noticed right away that the soft grip handles are not as comfortable as their more expensive saws. They still use their anti-vibration features here, but they are just less effective. On the plus side, the 4016 weighs a shade under 13 pounds. That lightweight combined with the anti-vibe features mean an operator can handle this saw with ease. Like other Poulan Pro saws, the chain tensioning wrench snaps into the back of the handle. That makes it super-convenient. Nobody wants to walk back to their vehicle, garage, or toolbox to get at tool when they are working with a chainsaw. I don’t know what other manufacturers don’t follow this example. The auto chain lubrication works well, and the little window helps you keep tabs on how much more chain oil you have on board. This little saw surprised me at how strong and robust it felt. As you move down in the size and price range, it’s pretty common to cut corners. As customers, sometimes we’re left with something that feels cheap or gimpy. I think Poulan Pro learns a lot with their semi-pro models, and they keep their less expensive saws on the tough end of the quality and durability spectrum. 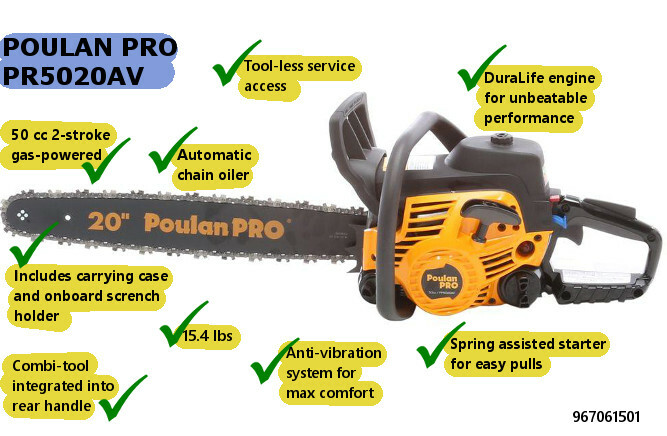 Conclusion | Choosing A Poulan Pro Chainsaw? You will notice some consistency here across my reviews of the Poulan Pro lineup this year. All of their gas-powered chainsaws leverage their OxyPower technology. The whole point is to reduce fuel consumption and emissions, thus moving the company’s products into a “greener” space, without negatively impacting the customer experience. You’ll also notice all their saws are designed with a focus on comfort. It says a lot that Poulan Pro spends the extra time and money to include an anti-vibration system, not just on their biggest and most expensive saws, but on the less expensive ones too. The unique cyclonic SuperClean air filtration system found on all their saws (except the battery one of course) is the exact same as what they put on Husqvarna saws. It’s not perfect, no feature is ever perfect. But I think it’s an awesome idea and probably worth a look when comparing to saws that don’t have the feature. Nothing ruins a good cutting experience like a saw that starts bogging, misfiring, and running poorly. That’s most often caused by a clogged/dirty air filter, so kudos to Poulan Pro for doing everything they can to squeeze more cutting time and less maintaining time out of their saws. Poulan Pro’s battery saw, the PRCS16i, is the real deal. It has the power and the runtime to make it competitive with some of the best battery saws out there. And true to form, Poulan Pro has thought up some nifty little features and gadgets, and put the package together at a very competitive cost. Poulan Pro isn’t some kind of fly-by-night company. They’ve been around for decades, and they have a solid reputation. After trying out much of their 2018 lineup, I’m convinced that these saws will resonate with the value shoppers who need high performance and durability. The way Husqvarna and Poulan Pro share technology and use the respective brands to attract buyers in different segments reminds me of the interplay between luxury brand Lexus and their sister brand Toyota. There are undoubtedly cheaper saws on the market. This is not the bottom-of-the barrel, import junk we are always on the lookout for. This is real value, that I think makes sense to the casual homeowner. 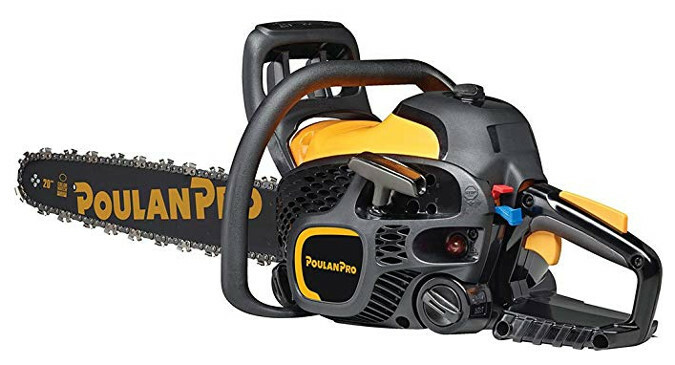 Given the pricing I see for these saws in the market right now, it’s no surprise to me that Poulan Pro is one of the largest volume manufacturers out there right now. I think they’ve hit the nail right on the head, and are offering a fantastic 2018 line-up that appeals to a wide variety of pro-grade experts.